Made the trip to Iowa on Sunday and picked up a gun from our very own Mike Brooks. I commissioned Mike to make this gun, a copy of an early trade gun featured at the Museum of the Fur Trade in Chadron, Nebraska. Mike did a great job capturing the spirit of the old gun, which was stocked in curly ash. Can't wait to shoot it. 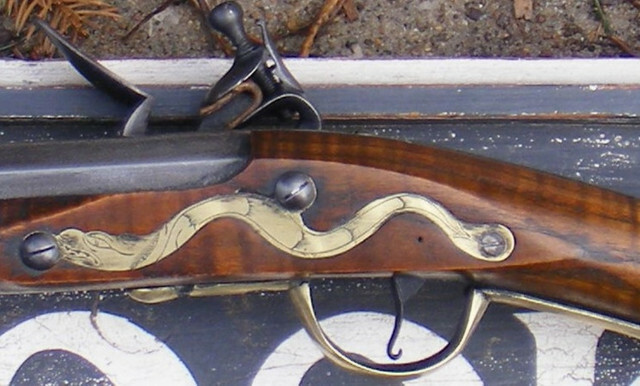 20 gauge, 42" Colerain barrel with L&R Queen Anne lock. Mike did a one-off casting of the trigger guard and fabricated the early sheet metal style serpent side plate. If we ask him nice, he might post a few pictures of the gun. PLEASE! PLEASE ! PRETTY PLEASE! Mr. Brooks may well be the premier builder of our time. His ability to capture the soul and character of the old guns is beyond measure. His eye for correct architecture, flawless. Nothing short of the word “art” is appropriate for his work, unlike so many builders out there. He’s really good but don’t make his head explode. Isn't it a little late?? I'm a bit vexed. There was no picture for me.Maybe I ain't supposed to have one. Man you guys must not hunt, you don't hang out the bait and them set off firecrackers. You'll scare 'em off for sure. And everyone wonders why I'm a legend in my own mind! I can rattle off an easy 1/2 dozen people's work I like better than mine, but thanks for the ego boost! Guess I better get busy getting those pics cropped and posted. For some reason I can't down load pics...that's a first. I think our "free" image hosting service is having website problems. Give it some time and see if it starts back. I get one picture with some old fart in front of a wall. I must say, the gun looks quite fair, in the enlargement. Ok, pictures work today. Pretty curly eh? I stained with Kibler's stuff, I thought the color turned out great. That guy is really ugly in enlargement. the rear end of a bull dog he could tree the devil . In the interest of seeing Mike's head explode: Mike, outstanding job on that beautiful fowler! Still saving up my coins for one of your prizes. My big regret ( don't tell Mike) was not buying that Lehigh that he had at the CLA. I think Stoner got that one. But being frugal and cheap. I miss on several nice guns. Always figure I can go home and cobble something up.!! I’m pretty sure that he’s going to have another Lehigh at the Knoxville show. Get off some of that cash you’ve hidden away! Well, I hate to see a fella live with big regret so I saved that one back for you. Bring money and a gun case to the up coming TN show and it's yours. Mike , Your a master of blending the look of the old and the new . Stoner I got one of those box lunches for yeah !! But some how I think if you see something that lights your fancy. Your going to find away !!! Dang Mike, that is beautiful work. I especially like the side plate. Nice. That's a beautiful piece of wood. The color did turn out really nice, did you just use Kibler's iron nitrate or did you use the tannic acid too?